The new financial year (FY) has just begun, and this is the right time to finalise your investments and taxes for FY20. While everyone knows the importance of planning, many dodge taking such decision until the end of the fiscal, only to hurriedly invest money here and there to meet the March 31 deadline. Not only does this reduce the returns that your investments can earn, but also fails to serve long-term goals. In FY20, get your tax planning right in the beginning itself and not wait for FY20-end. "For better tax planning, it is always good to start well in advance. Estimate your tax liability for the year. Explore all avenues to save taxes and how much more you need to invest. 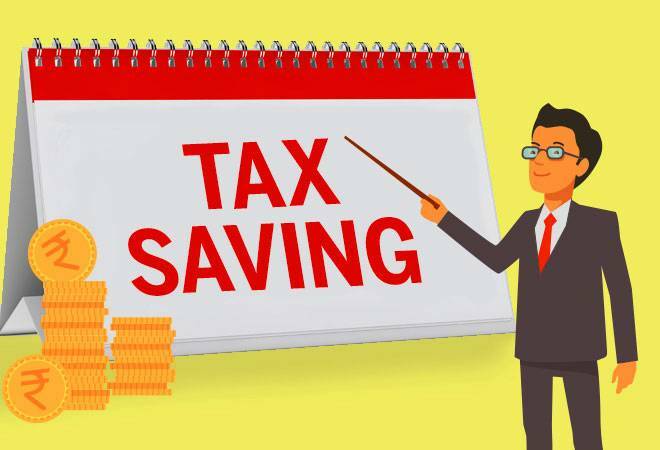 Instead of making tax-saving investments at the last moment, it is better to spread the amount throughout the year to avoid stretching your finances," says Divya Baweja, Partner, Deloitte India. Financial planning is more important than tax planning. First, you need to figure out your goals and how much money you require to achieve those goals. Accordingly, zero in on suitable investment avenues. The investment instruments must first align with your long-term goals. Look at tax efficiency only as an added benefit, and not the other way round. A quick calculation to simply meet the tax deadline and limit reduces the returns you could have otherwise earned on the same amount had you planned well and started on time. For example, Rs 50,000 invested in PPF in April will earn you more returns over the year than the same amount invested in February or March. Similarly, money invested in an equity-linked savings scheme (ELSS) will stay invested in the market for longer, and thus probably earn higher returns, if invested in, say, April, or in a staggered manner throughout the year, rather than invested as a lump sum in March. "April is a suitable month to plan investments because most companies revise salaries during the same time. So, you can be astute in money management. Investing in a staggered manner is a good approach as you may not have the money in bulk at the end of a year or even at the beginning of a year. If you can indeed invest a good chunk in April itself, nothing like it," says Suresh Sadagopan, founder, Ladder 7 Financial Advisories. People tend to buy multiple health and life insurance policies in order to save taxes just because insurers quickly process the premium receipts you need at the end of the year. This approach is wrong, for two reasons: one, you invest in wrong products, and two, buy the cover of an inappropriate amount. "When you make tax-related payments in February or March, you don't have time to evaluate all the options properly. You are under pressure to submit investment proofs, so you go for investments that give you tax receipts immediately. That is why people buy insurance. In doing this, you end up buying the wrong products," says Sadagopan. For instance, what you may need is term insurance, but buy a unit-linked insurance policy without understanding its features. Moreover, your insurance needs change according to the different stages of your life. So, focus on the insurance coverage while buying a cover, and not just premium. A basic rule to follow is not to mix your investments with your insurance. Mixing the two is detrimental to investments as well as insurance. Avoid investment-linked insurance policies and go for pure play plans. In the process, you will reduce costs and ensure adequate risk coverage. If your insurance needs are met, there is no need to be over-insured. You can invest the money in other tax-saving products. This will also help you stay aligned with your overall long-term investment goals. What are your tax-saving options? To start with, consider linking your future goals with options available under sections 80C, 80D and 24 of the Income Tax Act. Your choice should also match the time you have in hand to achieve your financial goals. For example, a young person may go for PPF under Section 80C as that has a lock-in period of 15 years or ELSS which gives better returns if invested for the long term. It is inadvisable for a senior citizen to choose the same investment avenues. They may instead evaluate five-year tax-saving fixed deposits (FDs). The premium paid towards health insurance policies qualifies for deduction under Section 80D of the income tax Act. Currently, this is Rs 25,000 for the insurance of self, spouse, and dependent children. An additional deduction for the insurance of parents is available to the extent of Rs 25,000 if they are less than 60 years of age, or Rs 50,000 if aged above 60. 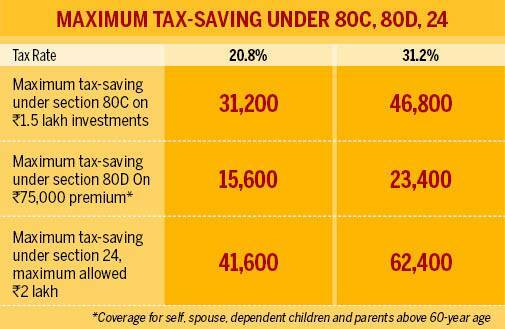 If both the taxpayer and the parents are aged more than 60 years, the maximum deduction can go up to Rs 100,000. If you have a home loan, the interest payable on it is tax deductible under Section 24 up to Rs 2 lakh per annum. An additional deduction of Rs 50,000 is available under Section 80CCD(1B) for those who have invested in the National Pension Scheme (NPS) under Section 80C. 1) Earlier, the rebate under Section 87A was Rs 2,500 for resident individuals whose total income did not exceed Rs 350,000 per annum. This year, the rebate has been increased to Rs 12,500 for resident individuals whose total income does not exceed Rs500,000 per annum. Accordingly, in the case of resident individuals having total income up to Rs 500,000, no tax will be payable. 2) The standard deduction for salaried individuals has been increased from Rs 40,000 to Rs 50,000. 3) Earlier, an individual owning more than one self-occupied property was required to pay tax on the notional rent on the additional property/properties. From this FY, the notional rent on the additions self-occupied or vacant property will be exempt. However, the limit to claim house property loss from interest on loans taken for both the properties in aggregate will continue to be Rs 200,000. Hence, you can claim a maximum of Rs 200,000 for such properties in one FY. 4) Earlier, if you had capital gains from selling a house, you could use that money to buy only one house to get the tax exemption. This year onwards, you can buy two houses, but the capital gain amount should not exceed Rs 2 crore. Further, this benefit can be availed by an individual only once in his lifetime. 5) Till last year, banks or post offices could deduct TDS (tax deducted at source) if the interest earned for the year from deposits exceeded the threshold limit of Rs 10,000. This limit has been raised to Rs 40,000.